Need something? Ask for it in the comments below. Someone may have it and no longer want it! If you have something you no longer need or a service you can provide, you are encouraged to list it or a link to it in the comments below. There is no cost to either the seller or the buyer. This is simply a place to deposit your links and to unite buyers and sellers, givers and receivers. I plan to make a new post each week, so if there are more items to sell or the product has not yet been sold, just add the link again each week. Artists can post their services; people with extra stuff lying around can offer it for sale or even for free; Heck, you can even list your Pocket tokens for sale or an offer to buy some! 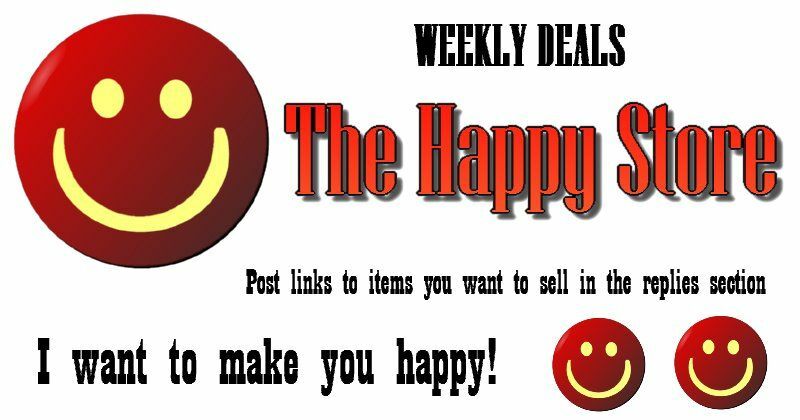 If you want to see what is being offered, simply search the #happystore tag to search for these posts. I sincerely thank you for your interest! Thanks for the re-steem and support. I'm no artist, but I could try to conceptualize something for you. Do you have any guidelines of what you are looking for as far as concepts, goals for the company, what kind of music it is, appropriate colours, etc.? What message do you wish to convey with the logo? We just went through designing a logo for my son's company last year. I drew up the idea and then he refined it to make the finished product. Are you an author that would like to turn your work into an e-book but don't know how or just don't have the time? I can help at 14 USD - Steem/SBD (equivalent) per hour. Simply reply to this comment if interested. I want to try making a custom ring tone but don't use a cell phone. If anyone has a sound file that they wish converted to a custom ring tone, I am willing to try to convert it to whatever file format your phone or tablet requires. No cost.